For a few years, it has been an open secret that there is a white Red kite in Central Wales. The kite is occasionally seen at the Gigrin Farm Red kite feeding centre. 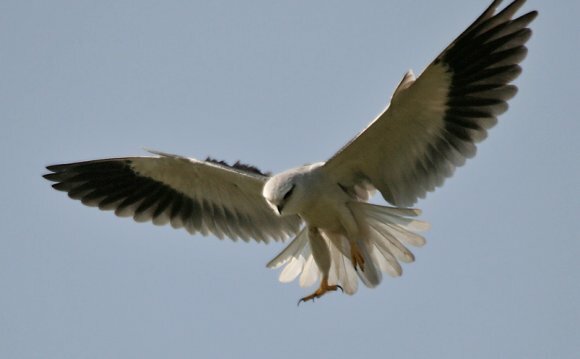 The kite is almost certainly ‘leucistic': Leucism is a very unusual condition whereby the pigmentation cells in an animal or bird fail to develop properly. This can result in unusual white patches appearing on the animal, or, more rarely, completely white creatures. Scroll down to see more images of the 'white kite'. Gigrin Farm is central to the Red kite success story in Wales. After years of persecution, Red kites had disappeared from almost the whole of the UK apart from Mid-Wales by 1900. Even here, despite the efforts of some local farmers and landowners, the population dropped as low as 20 birds in the 1920's. Thankfully today the Red kites are one of the great success stories as hundreds of birds now thrive in Mid Wales and they have also provided the stock for relocating kites to the Chilterns, North East England, the Grampians and Ireland. What kind of Bird is this ? White Tailed Kite ?